Nov. 8, 2018—There's good—and not-so-good—news when it comes to childhood vaccines in the U.S., according to a recent Centers for Disease Control and Prevention report. By their second birthday, kids should get several shots that protect against more than a dozen diseases. The good news is that most kiddos are getting those shots on time. But the report also points to an alarming trend: In recent years, there's been a gradual uptick in the number of kids who receive no vaccines by age 2. That number went from 0.3 percent for those 19 to 35 months old in 2001 to 1.3 percent for those born in 2015. Compared to kids covered by private insurance, those with Medicaid or no insurance were less likely to be vaccinated on time. Vaccination rates were lower for kids in rural areas. The report's authors offered some suggestions for improving vaccine coverage. One is the Vaccines for Children (VFC) program. 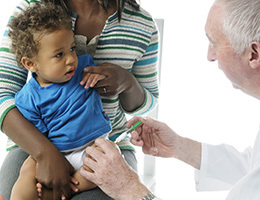 It provides free vaccines for eligible children, such as those who are uninsured, underinsured or eligible for Medicaid. But many parents may not be aware of the VFC program. Other barriers also may need to be addressed, the report suggests. These include lack of transportation and child care. There's also a shortage of rural healthcare providers. For more details, read the report. Are your child's vaccines up-to-date? This infographic can help you be sure.